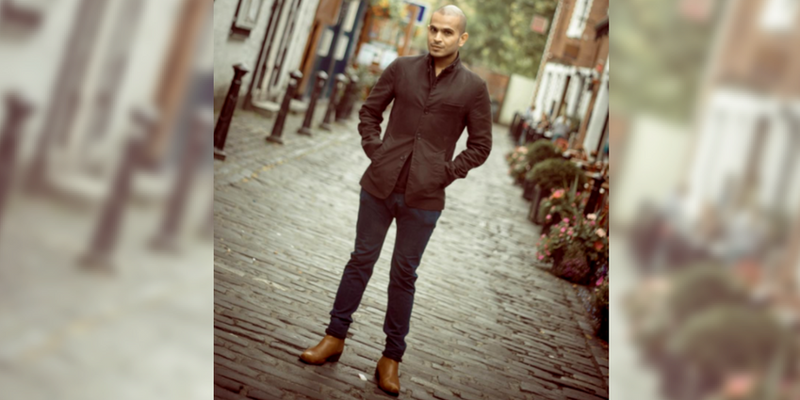 India-born, Glasgow-based designer Ayush Kejriwal never imagined he would be a renowned fashion designer with celebrities, like Vidya Balan, wearing his pieces and over 134,000 followers on Instagram. Yet, with bright, traditional and vibrant fabrics modeled by every-day women who challenge our common conceptions of beauty and fashion, it is no wonder that Kejriwal is one of the hottest up-and-coming names in the fashion scene right now. With his recent successes and controversies in mind, especially surrounding an Instagram post of a hijabi model wearing a sari and his emphasis on using dark-skinned models to show off his designs, Kerjiwal reflects on what it means to stay true to oneself, the importance of self-love and standing up for one’s beliefs. Describe your background and upbringing. How did you get into fashion designing? “I was born and raised in India, but I currently live in Glasgow. I came to the UK to do my master’s, and I have been here for the past 14 years. Since a very young age, I have been interested in designing and being creative. As a child, I watched my mother and grandmother wear beautiful saris, and I have always been attracted to them. I have a history with India, I romanticize India. Although I was encouraged to be a doctor, lawyer, etc. growing up, nothing else made sense. 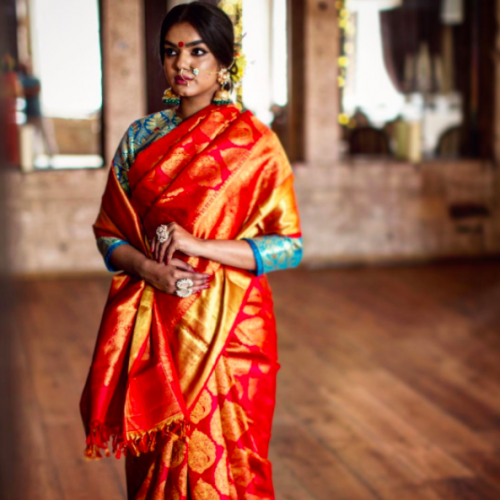 You said in another interview that “a sari is not just a fabric but a canvas that you paint your story on.” What has been your inspiration for your designs? Are there other designers or celebrities you look up to? “My day-to-day inspiration comes from the most mundane things in life – I don’t particularly look for inspiration on purpose. However, I’ve always fantasized about Indian culture. There’s so much beauty in our past, and that has been incorporated into my brand. I’m very disorganized when it comes to designing, but that’s because I’ve never been formally trained. I don’t know how to come up with a collection that has a particular element or style because I like everything. I don’t parameterize myself, but that’s how I enjoy it. I just go about doing what I want. It’s a beautiful disarray of things. I think I break all the rules in the book when it comes to fashion designing and marketing. It seems like you’re sending a message through your clothes that women of all colors and backgrounds can wear and feel comfortable in your designs. Who is your target audience, or who do you want your customers to be? “When I launched my brand, I was clear that my brand would cater to everybody and anybody who was comfortable in their own skin. I had a vision of mother, sister, and grandmother in my head, and they are normal people, not celebrities. For that vision to come true, it was important for me to portray my work with real women. When I look at my journey, it seems like I was being deliberate, but nature doesn’t differentiate in color. A red rose grows in brown soil. Who am I to say who can wear what? For us not to try different things and not wear something just because we are dark or ‘less beautiful’ is not something I agree with. Social media has given me the power to influence. 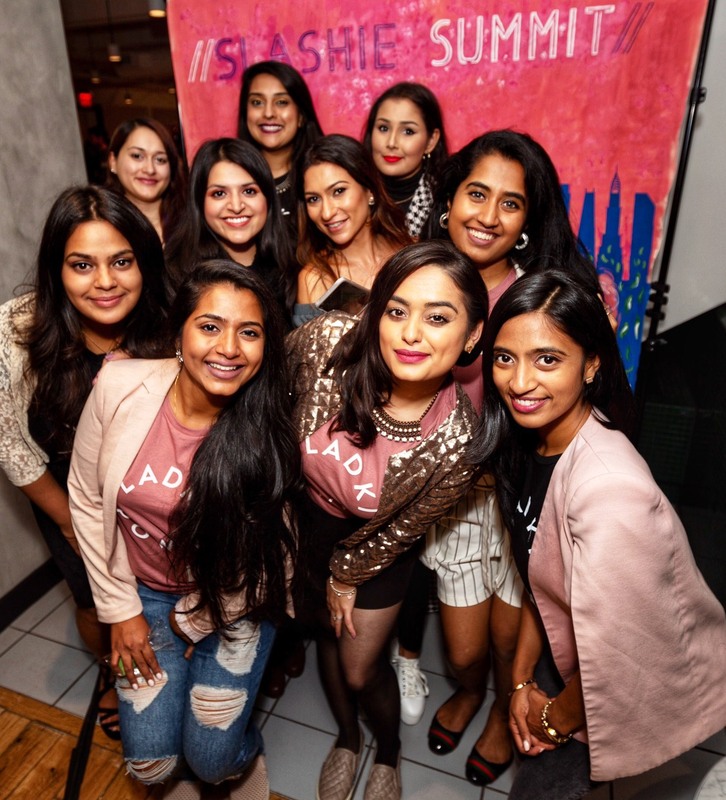 I have a social responsibility, and I’m using it to give out a positive message and empower women, make them feel confident and help them feel good about themselves. Image building is a huge part of fashion, and I want to showcase something real. Many pictures on Instagram don’t show the real thing, which is a problem when young people are impressionable and feel bad about themselves when they don’t look like those models. 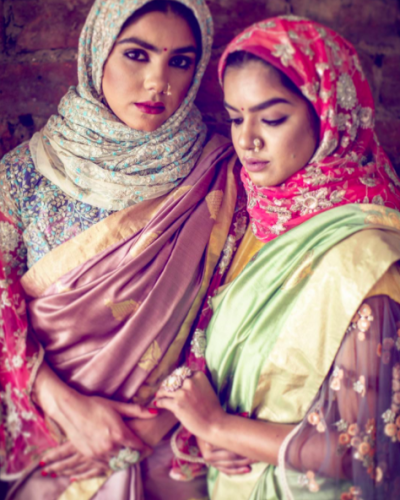 You received a lot of backlash for uploading a picture of a hijabi model wearing a sari. How did you deal with that? What would you say to women who feel as though they don’t meet certain standards of beauty? “I always believe that someone somewhere will be unhappy. You will never be able to please everybody. The backlash didn’t bother me, but I felt like I needed to stand up to it because it’s very easy to hide behind an online profile and say unacceptable things. I was bullied as a child, and I will not tolerate it, especially on my profile commenting on my models. I wasn’t prepared to sit back and just take it. Who was that person to say saris are just for Hindus? Religion doesn’t say anything about that. If you want to be a part of my journey, you have to be liberal, respectful and tolerant. It’s my film – I’ll show it as I want it. What are you currently working on, and what are your plans for the future? Are you looking to expand your brand and reach? “First of all, I’m extremely grateful for all the love and support people have given me. I might not have been able to respond to everyone’s messages and comments, but from the bottom of my heart, they mean the world to me. Do you have any advice for our readers looking to get into fashion designing, especially for desi clothes? 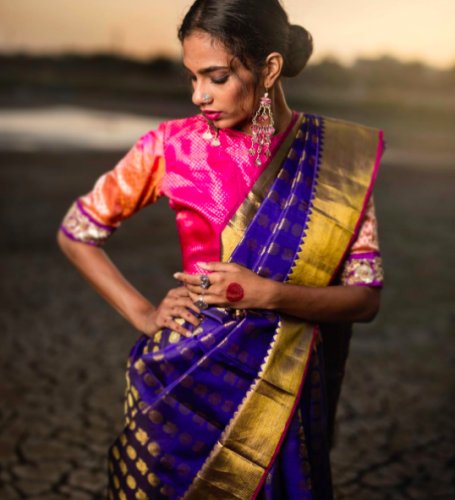 “When I see that there are so many beautiful boutiques in India that have really experimented with so many colors and textures and sell the most gorgeous saris and clothing, it makes me wish I was experimenting as well. I have a very limited breadth of work I can showcase because of where I am, but people in India are making bold choices and experimenting, which is great. Someone once said to me, ‘You make what you like, and people who like your clothes will find you.’ So my advice would be to stick to what you like, not the other way around. You need to create a market for yourself, your own niche, and people will find you. Otherwise, your inner creativity will never come out. Keep up with Kejriwal’s latest designs on Facebook and Instagram. Tina Lapsia is a law student at the University of Pennsylvania and a graduate of the University of Connecticut where she studied political science and economics with a minor in Spanish. She is passionate about politics, social justice, and women’s rights. 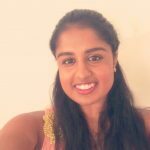 Tina is a fervent Bollywood fan and dance enthusiast and is currently a member of PENNaach; when she’s not listening to Hindi music, you can find her dancing to it! She aspires to have a career in international law while somehow being a dancer in Bollywood on the side.